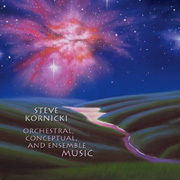 The eight compositions appearing on Orchestral, Conceptual and Ensemble Music (78'46") provide insight into the musical range of composer Steve Kornicki. The program moves from the live philharmonic textures of the opening piece to the rapid careening of mallet instruments on the closer. In between, it would seem Kornicki is occupied with writing the lost chapter of ambient music - the one pertaining to symphonic music. His work here is lucid, pensive and subtly charged. These works superbly express the complexional range of orchestral timbres through the exploration of harmonic opposition and variances in dissonance and resolution. The slow paced development, necessary in the overall musical drama, forges deep structures. The style is understated and concerned with quietude. Simple form and subtle motion provide a quiet elegance, while a palette of timeless symphonic timbres adds fresh insight into what this classic medium can aspire to. Kornicki's concepts exist in an eternal future outside of our time, a time where the secrets of the universe are made audible.